He created an area where three separate ecosystems collide within two different major physiographic provinces. Within these distinctions lie valleys, mesas, plateaus, mountains, faults and ridges. 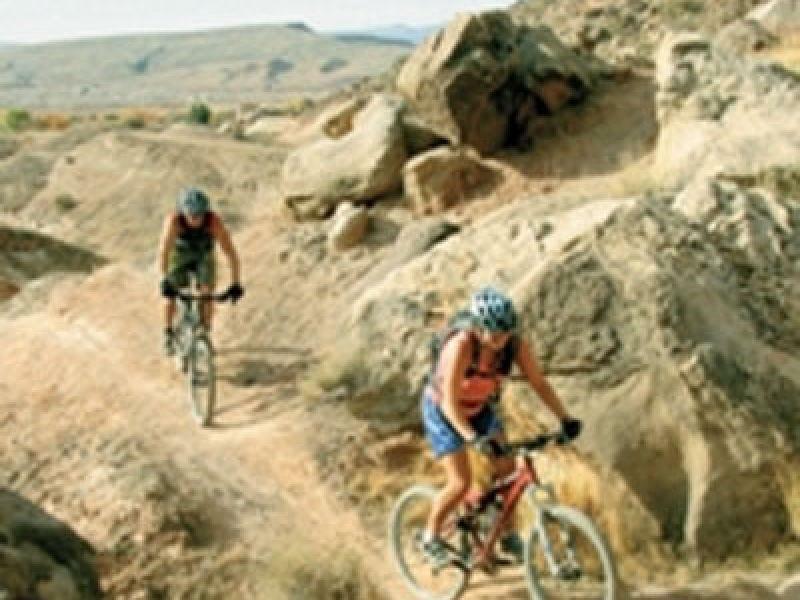 What is left for our enjoyment is an area where you can ride slickrock, single-track, desert trails and endless roads within minutes of a metropolitan area. And to top it all off, it is virtually unknown to the biking community. Among all of these features, flora and fauna, there are three reserves that have kept open space readily available and all have distinctive and extensive trail networks that cater to every level and style of riding. The Santa Clara River Reserve sits just outside of St. George and houses an impressive amount of trails for its size. This is a great area for families who want to take rides that are neither physically demanding nor require a high level of bicycle handling. The majority of the trails are old roads that take you to see historical sites around the Santa Clara River such as the old graveyard and the many washes that labyrinth through the area. All told there are 14 designated trails within the reserve. The Barrel Roll Trail is the highlight for more experienced mountain bikers. 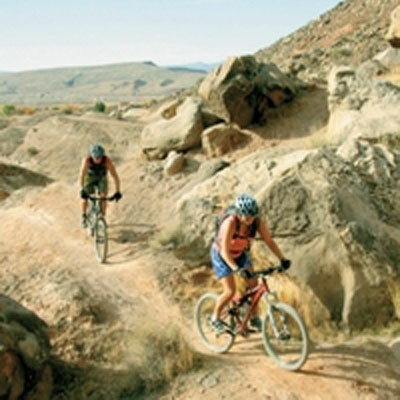 Completely single-track, the trail loops around the mesas, climbing and dropping. It climaxes in its middle at a point that provides an amazing view just before you hit a technical section that includes some rocky rollers and a few skinny ups. The Barrel Roll is rather short, only 5.8 miles, but makes for a great after-work jaunt or a late afternoon ride. Locals are known to use the trail as part of a bigger loop linking it with Stucki Springs and over to the Bear Claw Poppy Reserve for a good five hour or more ride. The Barrel Roll will keep your interest even if you ride the loop for a couple of laps. The Bear Claw Poppy Reserve sits just a bit south of the Santa Clara River Reserve and is home to some of St. George's oldest mountain bike trails. Anyone who has ridden in the area has pedaled the Bear Claw Poppy Trail that was originally known as the Green Valley Loop. This trail is a series of roller coasters and drops mixed into a bit wider, but smooth single track. It is fast, quick and a lot of fun. If the Bear Claw Poppy leaves you wanting more of the same, the Stucki Springs trail will feed your fix. Stucki Springs requires a bit more climbing but is on the same soil and geologic feature so it rides much the same. As mentioned, it can be linked to other trails in the area to create a bigger loop. Just outside of the Bear Claw Poppy Reserve sit the area known as the Green Valley Race Course. The course was built by Glen Ames and is still used for his Desert Rampage ride that is held every March. The locals have taken the racecourse and, using existing roads, have built an impressive system of trails. These are more technical requiring a higher level of handling as well as being physically demanding. This is also the area to go if you're into the big bike scene. Check out the Barrel Ride for some gaps, doubles and step-ups. The Zen Trail provides a more scenic trail but still requires a higher level of skill. It is possible to ride different varieties of these trails, looping them and such and turn it into an all day affair. Plus it is the gateway to the Bear Claw Poppy. The last reserve in the area is also the biggest. The Red Cliffs Desert Reserve was set up to maintain open space and provide protection and habitat for the endangered species endemic to this area. What this means for mountain bikers is awesome terrain completely closed off to mechanized travel. As the name suggests, the reserve is characterized by red sandstone cliffs, more commonly known to bikers as slickrock. The reserve spans across the entire area creating a band of undeveloped land north of St. George. For mountain bikers there are three areas of importance. The first area is known as Paradise Canyon. A short mellow ride through a scenic valley just off Snow Canyon Parkway, Paradise Canyon is a must for families or beginning riders. Once again, it is often looped into the trails from the two other reserves making for an all-day adventure. The next area sits just to the east of Paradise Canyon and is known as the Red Hill. Pioneer Park is open to biking and is a great place to practice and fool around on slick rock. This is a particularly good idea for novice riders or those who aren't familiar with the challenges of our sandstone. Just west of Pioneer Park is a trail known as City Creek, a physically challenging jaunt with a few technical features thrown into the mix. The longest trail in the Red Cliffs Desert Reserve is known as Church Rocks. This trail is ten miles long and consists of an out-and-back with a short loop on the end. The Prospector Trail, the out-and-back part, is smooth single track that parallels the freeway. It has no significant climbs and its rolling nature create a quick hoop-and-holler ride to the slickrock. The Prospector will drop you right into Church Rocks, which is a large red sandstone feature. This is the loop part of the trail and is almost entirely on slickrock. It contrasts what you have just ridden by being rough and technical and consisting of steep ups and harrowing rollers. For riders out for an all day excursion who wish to take full advantage of the scenery, a loop known as the Turkey Farm will take you through the Prospector and Church Rocks and climb up to the base of Pine Valley Mountain. It provides rarely seen views of slot canyons mixed into the juniper tree side hills. At 45 miles with some killer climbs, this loop is not for the meek but a must for the advanced rider. Yes, God loves us and has given us this place to ride. Now you know, but just keep it a secret so the hoards of unworthy riders stay elsewhere. For more information on trails, stop by one of the three local bike shops or visit the BLM office at 345 East Riverside Drive in St. George.